So U Did One Known Obsession? OR: One finished patchwork sudoku. I think the colouring works well to bring out the nine different blocks, and at closeup the individual squares made up of 1-9 patches are actually discernible. So will I ever make another? Possibly. 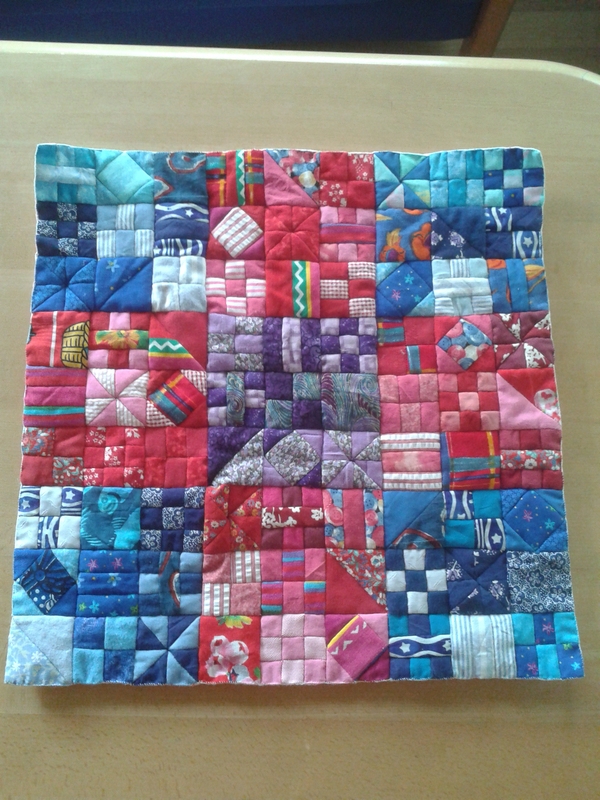 This example measures 40,5 cm x 40,5 cm and will most likely find use as a bread basket liner. The measurement is 27 units of 1,5 cm. each. But if one unit was 8 cm. the finished sudoku would be 216 cm. square, making it a good size for a bed spread for a double bed. It could be kind of cool. It seems there are advantages to feeling poorly an entire day. Sunday was one such day: Headache, feeling cold, knackered, hardly any appetite. Reading was impossible as I could read and re-read a paragraph three times and still not understand the words. Instead, sewing proved possible. My sudoku grew and now begins to show what it’s about. With three of the nine blocks done one can – at least in close-up – see how the square containing 3 stripes changes position from block to block as do the other squares. It still to a certain extent feels like a mad or at least rather odd idea. It’s an idea that actually works. GADS! 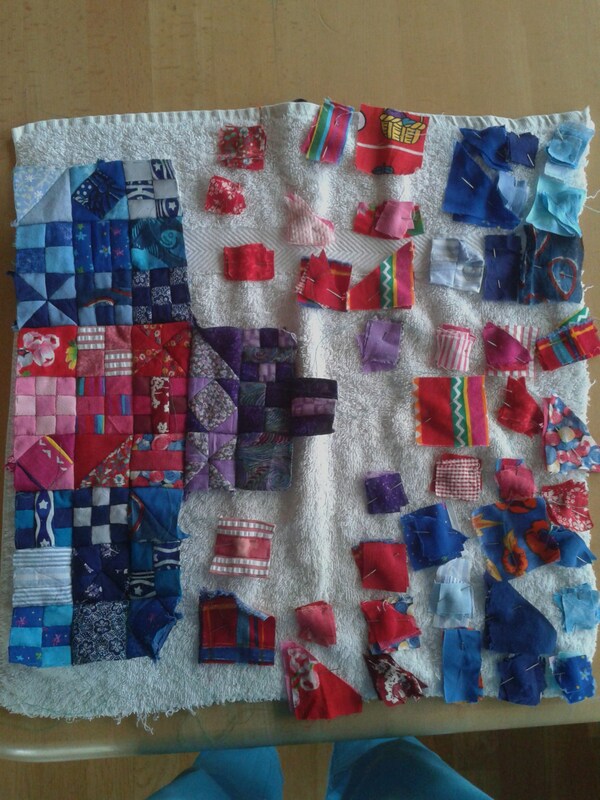 This piece of patchwork is forever a WIP. Or maybe it only feels that way. The obvious reason is that each of the 81 squares of which it consists is made up of 1-9 patches in themselves. Wait a minute – 1-9 patches? Is that the sudoku part? Yes. Thinking of ways to innovate patchworking I stumbled on the mad idea of crossing this old craft with maths. Of all things. Arguably, sudoku isn’t strictly math as much as it’s a brain teaser of a pattern. Which makes it completely obvious to turn into patchwork which is all abour patterns, right? So to keep a firm grip on the correct distribution of the squares I got an old guest towel, cut the pieces and pinned them on while keeping a solved sudoku by my side. 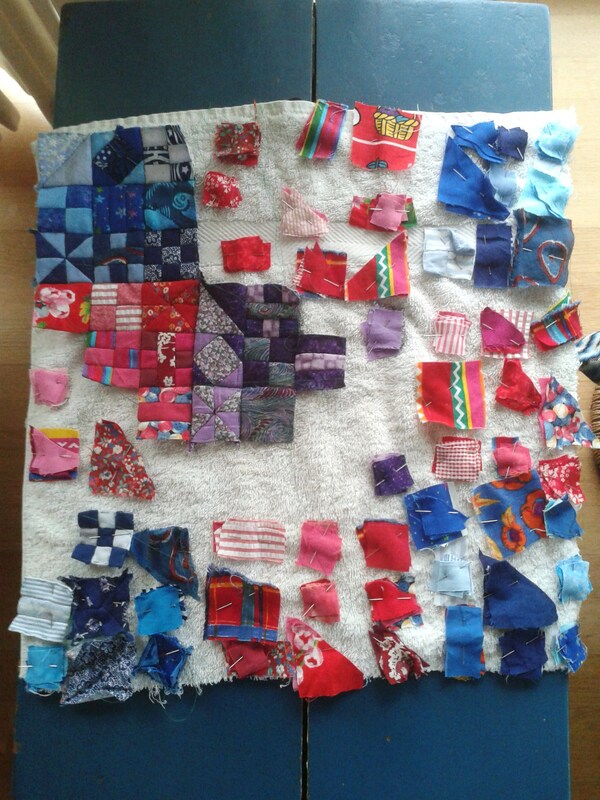 Each square is unpinned one at a time, edged (on my sewing machine as I’m not a complete hand-sewing fanatic), then stitched together by hand. The edge is basted into correct size and pinned back on until I can put more pieces together.